The Beacon Interval is how often your beacon transmits its advertising packet. The perfect frequency can be effected by environment, use case, and more. This is the third in our series of quick guides to help you optimize your beacon network setup and operations. Our first post discussed the optimal Beacon ID strategy for your deployment, and the second talked about Transmission Power. Today, we will learn about another basic configuration settings you can implement in your beacons, and how this affects your deployment and subsequent operations. The beacon “Interval” setting determines how often your beacon will transmit its advertising packet (i.e. basically telling nearby devices “I’m here!”) This is usually measured in milliseconds (ms), but can be measured in seconds (s) at the very highest interval ranges. In practice, however, you’ll generally only be concerned with the differences in milliseconds. There are (as of this writing) not many applications where using a second-long intervals is particularly useful. This may of course change in the future. The lower your Interval rate (smaller number), the more often the beacon will transmit its advertising packet. As you might expect, this has a dramatic effect on your battery life, as seen in the table below. You will notice immediately from the table that the current standard for the iBeacon profile (i.e. the settings recommended by Apple) actually causes dramatically reduced battery life. In reality, though, there are many cases where such a low Interval is pretty unnecessary. It’s worth mentioning, though, that even setting up your beacons to transmit every 100 ms doesn’t mean an iPhone can respond to the signal with the same speed. iPhone calls back every 1 second due to system limitations. Decreasing your interval won’t change that; it’ll only increase the chance that a device manages to grab one signal out of a few transmitted within this second. This might be helpful especially when your users are moving fast or there are many obstacles within a beacon range. On Android devices, there are no such limitations. Theoretically, you could develop an app that grabs and reacts to the beacon signal in seconds. We don’t recommend that, though, because it can cause a smartphone battery drainage. In our own lab analysis, we have determined that higher interval settings (over 700 ms) actually cause major issues with signal stability. However, we have also determined that using the 100 ms interval setting, recommended for iBeacon, is actually overkill for this issue. We’ve determined that 650 ms offers the perfect balance between signal stability and battery life, which is why we use this setting as our default option. There are some cases where you do actually want to sacrifice your battery life for the sake of indoor positioning accuracy. How do you make the right choice for your needs? It all depends on how accurately you need to determine the positioning of a device interacting with your beacon network. The beacon interval can make quite a big difference to positioning accuracy. When positioning a person travelling at normal walking speed, there isn’t much practical difference in accuracy between the 20 ms and 650 ms setting (our default). However, you can also see that with an Interval of 1000 ms (or 1 second), the positioning accuracy drops substantially, and you cannot tell precisely what path the customer was taking. This may or may not be a big deal for your use case, but it is important to understand the distinction. When should you use a low Interval setting? The object you are tracking tends to move quickly. For example, we have some cases with auto manufacturers who need to accurately track the location of a moving car. You need to know the object’s location by inches or centimeters, rather than by feet or meters. If neither of the above two points are applicable to your use case – then we highly recommend using an interval setting between 250 ms to 400 ms for the majority of deployments. Anything lower than this will quickly drain your battery, and anything higher may have performance issues due to signal instability. Remember that we use a default beacon Interval of 650 ms, because we find it offers the best balance of performance and battery life in most cases. Yes, it is true that Apple recommends a 100 ms Interval for the iBeacon profile. Don’t worry about it. In practice, we find this setting to be very wasteful, and it adds unnecessary hassle when deploying any significant number of beacons. Save yourself the headache and use a higher interval setting. The 100 ms recommendation from Apple is precisely that—a recommendation, not a requirement. We believe that Apple will eventually agree with us and change the recommendation to something more practical in the real world, and based on actual implementation experience. Your beacons will still work with iOS devices just fine, regardless of your Interval setting. Actually, they’ll work better in most cases, assuming you use our recommendations. Anyone else experiencing this behaviour? Hi – i’m not finding your address in our database so can’t tell anything about your account. I recommend sending a support request to support AT kontakt.io (with your account email please) – there could be many reasons for this (outdated app / firmware, config settings, API call etc.) but thankfully they are usually easy to solve once diagnosed e.g. update, changing a setting, checking/unchecking a box, or code line edit. Can I stepless set the interval or what intervals are available? You can choose any number from 1 to 10,240–just by typing it. how exactly do I set the interval ? Is it via a particular software or there are settings option on the beacon hardware? How does the interval setting in the beacon device work in conjunction with the sdk(android) or should i ask where do i set the sdk to react to a low interval beacon device, (since the active scan period window is 3 seconds min) ? I’m not sure if I understand you correctly, but the scanning period doesn’t influence the interval. You may set both using the SDK and adjust their values to work well with each other. So how would i set the SDK to work well with a beacon which has interval settings of 100ms differently than i would set it to work with a beacon that has 1000ms interval settings ?, is there a manual that shows the sdk settings to work with different beacon interval settings ? Well, they’re rather intuitive. If your interval is long, your scanning period should be longer, too. How much? I don’t know, every use case is different. As always, I recommend running a couple of tests. The other question is whether it’s worth it–there’s no significant difference between 100ms and 1000ms in terms of scanning; they’re both shorter than the minimal scan period, so they should be recognized by a smartphone. First thanks for the quick response, so my new question is: how do i set the sdk to responde dramatically faster to distance changes, since although i set the beacon to the minimal interval 100ms i do not see any improvment in the sdk response speed to distance changes (and i set it to low latency in the scan mode), i think the sdk is doing averaging on the signal strength or some kind of LPF. My expectations (since i set the beacon to minimal interval) were to see very fast updates on my movement. ? Kobi, what you’re struggling with, has in fact nothing to do with the scan period. It has also nothing to do with our SDK, because it’s designed to collect every single beacon’s signal. It seems the problem here is the smartphone itself. Different smartphones handle Bluetooth differently, some just can’t scan faster. 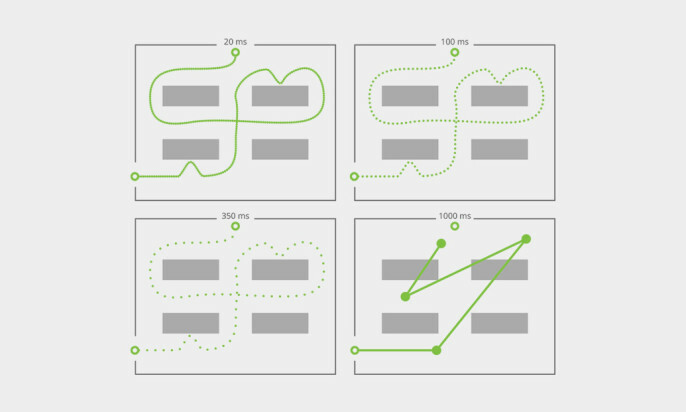 We ran some tests that proved that tracking accuracy massively depends on hardware. But even if you manage to get the best hardware, I’m afraid you won’t achieve the quality and accuracy you’re aiming for–smartphones, unfortunately, aren’t designed for super fast tracking. My advice is to test other devices and see what’s the maximum performance you might achieve and whether that satisfies you. I’m sorry I can’t help you more. You state that intervals above 700ms causes signal instability. What do you mean by instability? When working with high intervals you can observe increasing bit error rate. Imagine that you lose some of the bits of beacon interval packet. Device will not discover it, now you need to wait once more the interval time to “give it another chance” to be discovered, also it can cause that some of the application will behave like you would leave the beacon region. so is it right that changing the beacon interval value does,nt affect the wifi range but affect the speed,performance ? I want to use moving average filter to smooth the fluctuating RSSI. However I’m confused with the exact size of window. The advertisement interval of my beacons are 330 ms (three packets per one iOS scan (one scan per second)). Considering 330 ms advertising interval and 1.2 m/s walking speed, what should be the size of filter window for better performance?